← How may I merge or duplicate Twitter accounts? I may have been overlooked, once again, in the new year’s honours list, but in mid-December I received an unsolicited and very flattering email; I’d been nominated, by their Regional Programme Manager, to become a Fellow of the Royal Society for the encouragement of Arts, Manufactures and Commerce (the Royal Society of Arts, for short, or RSA, for shorter). The nomination was “for your work on open data, Wikipedia and social media”. You could have knocked me down with a metaphor. 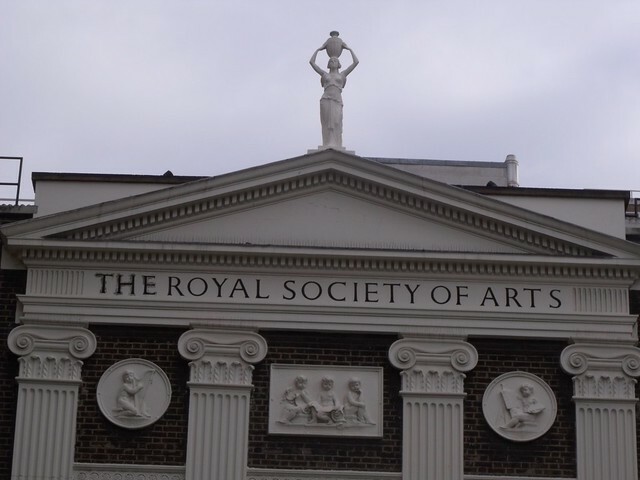 Founded in 1754, the RSA is an independent enlightenment organisation committed to finding practical solutions to today’s social challenges (their email pointed out). That sounded right up my street. I was delighted to accept, and confirmation arrived by e-mail on Wednesday. I’m in some illustrious company. My fellow fellows include Sir Tim Berners-Lee, Dr Sue Black, Stephen Hawking and Gareth Malone. Past fellows have included Charles Dickens, Benjamin Franklin and Karl Marx! As a fellow, I shall have use of facilities at the RSA headquarters, off The Strand, pictured above. I shall henceforth refer to this, tongue firmly in cheek, as “my London club”. My fellowship also means that I now have extra initials after my name. I’m “Andy Mabbett, FRSA”. But you can still call me Andy. This entry was posted in about me, humour, open data, social media, Wikipedia and tagged FRSA, open data, Royal Society, Royal Society of Arts, RSA, social media, The Strand. Bookmark the permalink. What an honour….only a matter of time before you are Lord Mabbett of Birmingham. Wow, how lovely 🙂 Congratulations!